Identification: Upperside is brown with no markings. Underside is brown; both wings have many small eyespots rimmed with yellow. Life history: Adults have a slow, weak flight, and are usually found flying in the forest understory. Males patrol during the day to find receptive females. Caterpillars eat leaves. Flight: Several broods throughout the year in South Texas and the Deep South; three broods from April-October in the northern part of the range. Caterpillar hosts: Carpet grass (Axonopus compressus), centipede grass (Eremochloa ophiuroides); probably St. Augustine grass (Stenotaphrum secundatum), Kentucky bluegrass (Poa pratensis), and others. Adult food: Sap and rotting fruit. Habitat: Grassy places and woodlands. Range: Southern New Jersey south along the Atlantic Coast to southern Florida; west to southeast Kansas, central Oklahoma, central Texas, and Mexico. 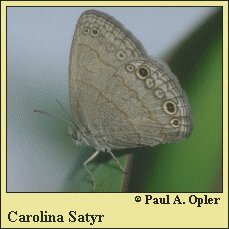 Note: This butterfly was formerly called Hermeuptychia hermes, but the type locality of hermes is South America and North American populations do not represent the same species.